at a minimum cost of time and expense! We offer this opportunity from the perspective of practicing and experienced dental assistants, in the setting of an actual dental office. While we will strive to give you exposure to a wide range of techniques, materials, and dental knowledge, we will focus on the skills that dentists see as core necessities for job acquisition. Job opportunities for trained dental assistants are quite good in today's marketplace. While no one can guarantee job placement, the dental profession is currently facing a shortage of trained dental assistants. If one examines the want ads for dental assistants, virtually all jobs require experience. How can you get a job without experience, and how can you get experience without a job? With our course, we believe that gap can be bridged in a minimal amount of time at a reasonable cost. Welcome to N.O.D.C. School for Dental Assisting! This course of study came into being as a result of conversations between dentists. Every dentist recognizes the importance of a good dental assistant in helping him or her provide excellent services to patients, reduce stress on both the patient and the doctor, and keep the practice growing and profitable. Given the shortage of trained dental assistants, the existing obstacles for a person to go to school for training, and the unwillingness of dentists to train someone with no experience, N.O.D.C. School for Dental Assisting came into being. The philosophy of N.O.D.C. 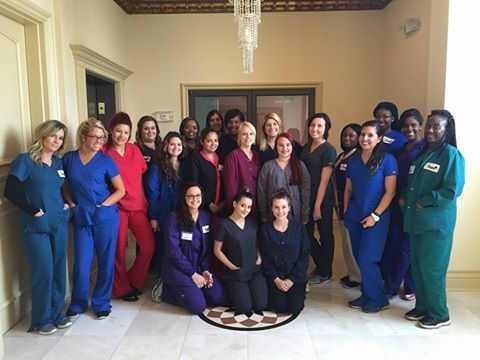 School for Dental Assisting is based on the belief that people can be trained in a relatively short period of time to enter the world of professional dental assisting. We believe that our course will prepare any motivated individual to get her/his first job. We also believe the amount of on-the-job experience, not classroom hours, is the best teacher. Therefore, it is our purpose to equip each student with the basic skills necessary to enter the workplace and begin to gather experience. We feel that our many years in the profession not only qualify us to teach these skills, but also give us the opportunity to impart what "pearls" we have discovered along the way. The course is held for fifteen (15) consecutive weeks, on Saturdays, from the hours of 8:00 AM to 1:00 PM in the office of New Orleans Dental Center. Class sessions typically alternate between lectures and hands-on, clinical or laboratory experiences. Approximately two (2) 15-week courses will be offered per calendar year. N.O.D.C. School for Dental Assisting is licensed and regulated by the State of Louisiana Board of Regents. Brandy Foret (Owner and Instructor) graduated from Cuillier Career Center in 1994 and has been a Dental Assistant since then. She received her Expanded Duty Dental Assistant certificate from Louisiana State University School of Dentistry in 1998. She has worked at New Orleans Dental Center since 1995 and is the chief dental assistant there. Audrey Gaudet (Owner and Instructor) was a Dental Assistant and Hygiene Department Coordinator at New Orleans Dental Center from 1992 to 2015. She received her Expanded Duty Dental Assistant certificate from Louisiana State University School of Dentistry in 2005. Gina Sutton (Owner and Director) has been the Front Staff Office Manager and Receptionist of New Orleans Dental Center since 1991.